Mr. Dryden: Lawrence, only two kinds of creature get fun in the desert; bedouins and gods, and you're neither. Take it from me, for ordinary men it's a burning, fiery, furnace. Lawrence: No, Dryden. It's going to be fun. Lawrence Of Arabia is a film about many different things. While focusing on events in the life of T.E. 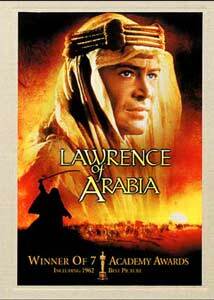 Lawrence, it spreads wide enough to include the events of his time: Arabs fighting with Turks during World War I and the tenuous relationship between the British and the Bedouin tribes of Arabia, as well as other subtle aspects, which perhaps mean different things to different people. Lawrence is also, of course, one of the greatest films in history. It is a project that seems to transcend both its story and the medium. David Lean, who already had a reputation for intense epics, re-invented the tremendous biopic and probably redefined filmmaking itself. Based upon the story of the famous British Colonel, T.E. Lawrence, Lawrence Of Arabia dares to capture the essence and intensity of his participation in the Arab uprising against the Turks during World War I. Although initially assigned to merely observe and assist the Saudi Prince Feisal, Lawrence takes an active role in designing strategies for the Arabian tribal armies and even participated in the combat itself. Lawrence commits himself to performing "miracles" for the Arab side, and he manages to accomplish many of them. Although Lawrence sought to achieve freedom for the tribes of Saudi Arabia by fighting his way ahead of the British armies, who were after the Turks, perhaps no one really knows the real motives for his bravery and leadership. Much of the source for the film came from Lawrence's own published account of his time in Arabia, The Seven Pillars Of Wisdom. The story of Lawrence is an amazing one. He managed to unite feuding tribes, occupy cities thought only attainable by massive military forces, and become respected by people who would normally harbor much hatred for an Englishman. Of course, a little dramatic license has been taken to make things a bit more epic and exciting, but nothing else would befit the story of T.E. Lawrence, a man whose ego was rather sizable and whose presentation of himself was certainly not considered modest. He was allowed this transgression, though, because he deserved it. He made fools out of British generals accomplishing things the English took weeks to do, and his skill in combat inspired both fear and respect. Wisely, Lawrence Of Arabia is not so much about the man as his exploits; how can we know who Lawrence really was? Did anyone truly know him? Certainly, opinions were plentiful; from those who thought he was the greatest hero in the world, to those who thought he was a horrible egotist that loved killing and also had a masochistic streak. Instead, the film is simply a depiction of the mystery, the adventure, and the era. Director David Lean carefully crafted a masterpiece by insisting, much like T.E. Lawrence himself, that the project be tackled head on. Filmed primarily in Jordan, Lean took the film directly into the desert and, in many ways, made the cast and crew go on an adventure similar to that of Lawrence. In circumstances of extreme heat, sand storms, and dealing with real-life Bedouins and other desert tribes, Lean still managed to produce some of the most beautiful footage ever created on film. Whether it's a massive battle sequence of horse-riders attacking an enemy column, or a simple, subtle scene in which a lonesome figure traverses a dune, the visual aspect of Lawrence is one of pristine beauty. Peter O'Toole leaps from the screen in his first major role as T.E. Lawrence, a role perhaps more difficult than can be imagined. O'Toole had to portray a legendary hero to the satisfaction of the world, but he also had to be controlled enough to retain the real-life mystery of the man. Alongside O'Toole are marvellous actors such as Omar Sharif, Anthony Quinn and Alec Guinness, all at their peak of performance. Despite an almost 4 hour running-time, they manage to keep their characters as fresh as when they first appear. Again, this is the magic of the film, because the wonderful crafting never seemed to collapse on itself. Lawrence Of Arabia was—and is— an unselfconscious epic. In the end, there is little I can say about the film that would really enhance its reputation. People already love the film while some hate it, just like attitudes held towards the man himself. It would seem hard to argue, though, that Lawrence is anything but a wild success about a man who dreams of adventure, gets it, and then isn't sure he wants it. Should we admire him, pity him, or be disgusted by him? Perhaps his lesson is that we shouldn't think anything of him, but rather follow his example and lead our own lives, finding our own adventure. Image Transfer Review: There has been some minor controversy over whether or not Columbia was using the right source materials and being faithful to David Lean's original vision (Lean was notoriously tough on the "remastered" prints done for the "Director's Cut", theatrical re-release in 1989). Ignoring all that, the disc certainly does look very nice. The source print is amazingly clean, with barely any defects visible. The only noticeable flaw is an occasional, vertical distortion of pale, white lines going down the image. As I understand it, this was a flaw that originated even in the first prints; heat damage from filming in the desert. Colors are generally good and rich with an impressive range of depth, especially considering that most of the film is restricted to a desert palette. Even night scenes are impressive; they aren't quite as murky or movement-filled as some movies of this age. There are no compression artifacts or other digital aggravations, although there is some obvious edge-enhancement in certain scenes. Some over-sharpening of the image was done, and it tends to show with characters becoming blurry the further they get from the camera. This sharpening seems to make the aliasing (from the 16:9 enhancement) much worse and more noticeable than normal. As it is, Lawrence looks wonderful. Could the transfer have been better? Arguably, yes, with more attention to the color saturation, but that's really something that individuals will have to decide for themselves. Without a side-by-side comparison of this disc to a digital master of the other existing 35mm restoration (once supervised by Criterion), I have to give this disc a thumbs up. I should also note that this version is indeed the 1989 cut, which restores footage that was removed in the late 1960s. The main difference here is that the overture, entr'acte, and exit music sections have been restored. Audio Transfer Review: The disc offers both a Dolby 2.0 Surround and a new Dolby 5.1 engineered mix. The 5.1 is more impressive than one might think. The brilliant musical score by Maurice Jarre comes across with amazing new clarity and depth, using all channels for theater-like sound. The majority of the soundtrack is mono and rooted in the center channel. There is directional dialogue and, in some scenes, stereo effects added to the on-screen action. Surrounds are used for some ambience and special sound effects; this is done pretty well and is used much more than the average pre-1980s film on DVD. In fact, Lawrence has one of the best 5.1 mixes of a 'classic', pre-multichannel sound film I think I've ever heard. The 2.0 Surround track carries most of the stereo detail very well, but lacks the same clarity and power of the 5.1 Although most of the surround activity is similar, the soundfield isn't as enveloping. The foreign language 2.0 tracks are basically the same, other than the obvious dubbing. Extras Review: All of the extra features are on the second disc in the set. The first, major extra is a 1 hour, making-of documentary by the great film documentarian, Laurent Bouzerau. Using a great deal of interview footage from 1989 (the year of the theatrical re-release), the documentary focuses on many aspects of the film's production. Especially interesting are the insights provided by director David Lean, who died in 1991 but not before seeing the restoration. The documentary is very good and well-paced (typical of Bouzerau's work), but one hour is, of course, not enough to really discuss the production. A multi- volume book might do better justice, not that this making-of is bad by any means. Another presentation by Laurent Bouzerau is a 5-minute interview with director Steve Spielberg on how Lawrence Of Arabia influenced him and his career. Spielberg, who was part of the 1989 restoration, basically discusses his meeting with David Lean and how he originally saw the film. Three of the four featurettes are old, black & white programs (the fourth is in color) from the 1960s, detailing certain aspects of the film's production. The featurettes are: The Camels Are Cast, In Search of Lawrence, Romance of Arabia, and Wind, Sand, and Star: The Making of a Classic. Each one is obviously dated, but has its own charm. Oddly, The Making of A Classic sounds as if the narration was re-recorded, with an obviously new voiceover with stereo music. The "Advertsing Campaigns" section is a reel detailing posters, lobby cards, conceptual art, and a variety of other items. It runs by itself, however, and can not be controlled by remote. There are filmographies for most of the central cast and crew, which are offset by a short newsreel from the original U.S. theatrical premiere in 1962 and the original theatrical trailer, which is widescreened at 1:85:1 and in fairly damaged condition. Trailers for David Lean's own The Bridge on the River Kwai, and The Guns of Navarone are also featured. I am unable to evaluate the DVD-ROM content, but as I understand, it is mainly behind-the-scenes photographs from on-set production. I do take issue with this being in DVD-ROM format, as there is really no reason this couldn't have been included as normal DVD features, accessible to everyone. We also have 7 subtitle languages, which seems to be a fixture now with Columbia. Presentation-wise, Lawrence earns high marks. The cloth-bound double case is stylish and classy. The booklet insert reproduces an essay on the film which was originally given out at certain showings in 1962. Menus are animated and expertly themed to the film, adding some nice atmosphere to this disc not present with static menus. I do have one complaint, though: Many films on DVD are being presented in their original theatrical style, using the opening, intermission, and exit sequences. However, these discs usually put the beginning of the film on chapter 2, after the opening music. For some odd reason, chapter 2 here actually starts AFTER the opening credit sequence, which means to see the start of the film you must sit through the opening music, or fast forward through it. There is no question, fans of Lawrence Of Arabia owe it to themselves to get this package. The grand epic is certainly worth the price admission, and the treatment here is excellent. Lawrence is a testament to the art of filmmaking at its finest: do not miss it. Highly recommended.